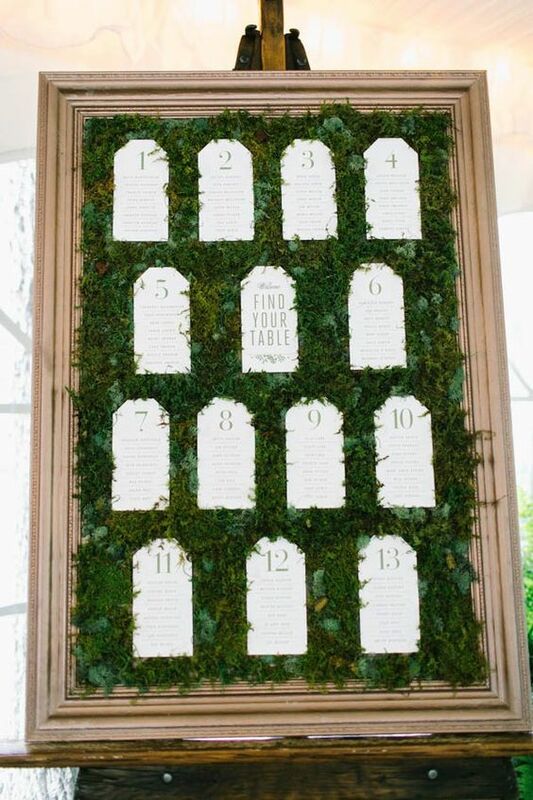 for #weddingwednessday this week we're going to do a final post about our seating chart. in part one of this project i had found a $10 frame copper and spray painted it copper. in part two i built a plywood box on the back (spray painted that green), zig-zagged some wire across the front, and planted a bunch of needle ivy and irish spring moss in it. now i just had to make the signs for who was at each table. since we were doing baseball teams (more on that soon) for the table names, i decided to do these as batting order cards! once again i used our signature font in powerpoint, listing the guests alphabetically by last name. then we (and I say we because victor had a hand in this part) assigned each guest a position based on how where they were in the batting order. for the tables that didn't have at least nine people we added a famous player or two from that team. finally we adjusted the positions so any famous players would be their actual position, I mean can you imagine if we had cal ripkin jr. down as an outfielder? the morning of the wedding victor ran to kinkos and printed them (and the menus) out on craft paper just like i had done for the save the dates, the RSVP cards, the tags, beer and wine map legend, and the programs. then my sister sammie cut them out at the local kinkos. finally our amazing coordinator clipped the cards to the wire using teeny tiny clothes pins i picked up at michaels.